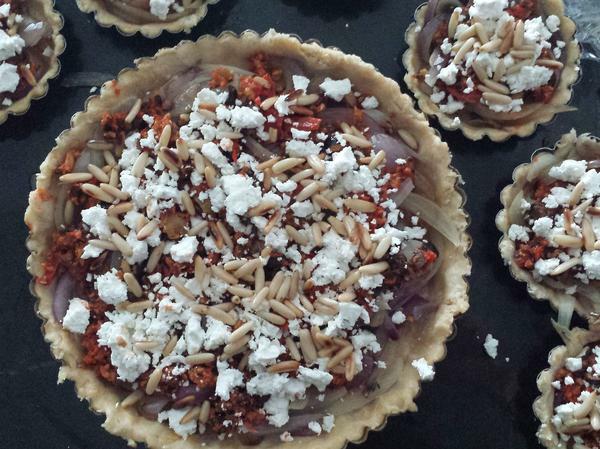 Brenda Abdelall's goat cheese and onion tart is a yearly Thanksgiving staple, and draws on flavors from her Egyptian heritage. She calls it her version of "American pie." Robin Ha and her mother, Cassie, at an airport in South Korea, on their way to the U.S., in 1995. 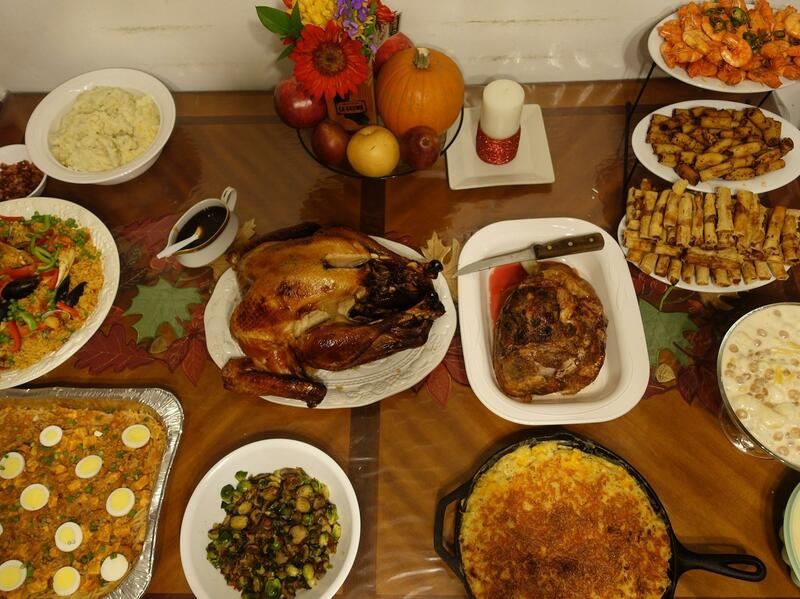 PJ Policarpio's Thanksgiving spread, last year. The feast includes Filipino paella, a noodle dish called palabok and lumpia, fried egg rolls. I asked five immigrants and second-generation Americans to share what Thanksgiving is like in their families, the dishes they most look forward to — and what the holiday means to them. These interviews are edited for length and clarity. And I'd love to hear your stories and see pictures of your food, too! Share them on Twitter or Instagram with the hashtag #MyPOCThanksgiving and we may feature them on NPR next week. Brenda Abdelall, 37, is an Egyptian-American from Oakton, Va. She is the founder of United We Eat, a series of short films on immigrant food in the U.S., and runs a Middle Eastern cooking blog called MidEats. Growing up in Michigan, I had no aunts and uncles to visit during Thanksgiving like many of my friends [did]. So we spent it with our family friends, a collection of Egyptian-American immigrants who moved here in the 1970s, and had a potluck. There was always turkey. My mom tried to make it as traditional as possible, but somehow [the bird] always had some Arabic flavors, like cumin. People would bring tabbouleh [an herb salad], baklava, and someone would always bring kofta [a ground beef kebab]. Today, my Thanksgiving looks very much like a traditional one, but I use ingredients from the Middle East: green beans with pomegranate molasses; onion tart with goat cheese. The first time I had cranberry sauce, I was 35 years old. We never had that on the table growing up. Now, I make a version using pomegranate seeds and star anise. I most look forward to the mashed potatoes. As a daughter of immigrants, Thanksgiving has become a central tradition in my family. We honor the traditions of my parents, the flavors and foods that they taught us, and continue to teach that to our children. Juan Diego Ramirez, 30, was born in Oaxaca, Mexico. He moved to South Los Angeles when he was 10, where he grew up. Today, he lives outside of Portland and is a producer for a food and culture podcast called Racist Sandwich and works for the Migrant Education Program in Hillsboro, Ore. I didn't celebrate Thanksgiving until I came to the U.S. It's not a holiday in Mexico. When my family first celebrated Thanksgiving, we didn't know what it was. We just saw it as time to be around our family. We didn't have turkey but roasted chicken. And there were tamales, salsa and a drink called atole. As the years went by, the food started changing. We incorporated turkey and mashed potatoes. We'd get the turkeys at the local church or the neighborhood community center, where they were giving them away. Turkey? I was never really into it. I never get any seconds. But if there are any extra tamales, I'll get seconds on that. Robin Ha, 37, is a Korean-American who lives in Washington, D.C. She was born in Korea and moved to the U.S. when she was 14. She is the artist and author of Cook Korean! A Comic Book With Recipes, and is working on a graphic memoir called Almost American Girl. 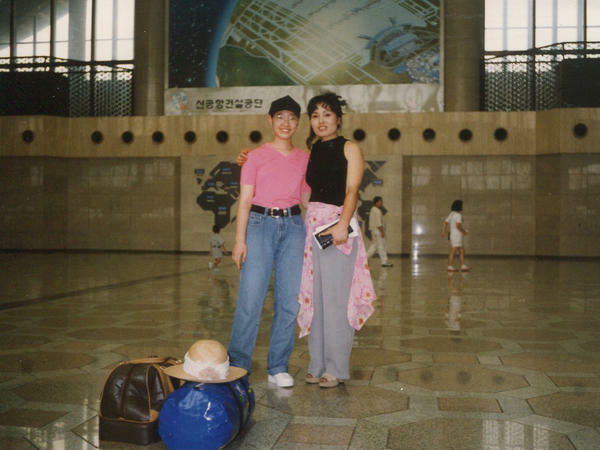 When me and my mom first moved to America, it was just us. So it seemed funny to go through all the turkey-baking. So we just went to Boston Market and bought chicken and turkey there and had a little dinner for ourselves. Turkey doesn't excite me much. It's dry and bland. The cranberry sauce was new to me, too. It's weird that people in America cook sweet fruit and put it on top of meat! Today, we celebrate Thanksgiving at my mom's boyfriend's house. He is white and his family has been living in Virginia since the 1800s. The first year, the food was very traditional: mashed potatoes, sweet potato casserole, green beans. But as the years went by, people started bringing non-traditional foods. My mom and I bring Korean fried chicken. Currently, I'm dating a half-Persian and American guy, and he comes to this Thanksgiving, too, and makes Persian jeweled rice. I actually do like turkey now. I look forward to the leftovers to put in a sandwich — with the cranberry sauce! Carine Umuhumuza, 30, is a Rwandan-American living in Washington, D.C. She and her family moved to New Hampshire from Rwanda when she was 7. She is the associate director of communications at Devex, an international development news organization. Thanksgiving is a time when our family cooks traditional foods that take longer, like isombe [a cassava dish with peanut sauce] which takes about eight hours to make. It's not something you eat on a weeknight. Rice is always part of Thanksgiving, and a meat sauce that's made with onions, tomatoes, beef and bay leaves. In Rwandan culture, you can't have a meal without sauce! Our family has always had the turkey and the mashed potatoes — but over the years, we've warmed up to other dishes. One of my aunts married a white guy, and now we have cranberry sauce. And as me and my siblings got older, we started liking stuffing, which we learned about from those very artificial Thanksgiving-themed lunches we'd have at school. I'd tell my mom, "We need to have stuffing!" I wasn't talking about stuffing from scratch — I was talking about Stove Top stuffing. For the diaspora that come into the U.S., Thanksgiving is one of those holidays that don't feel as foreign. Families of all generations and ages coming together? That's something that happens in Rwanda, anyway. It's the best entrypoint to American traditions. PJ Policarpio, 33, is a Filipino-American from San Francisco. He moved to the U.S. from the Philippines when he was 13. He is one of the co-curators of the Pilipinx American Library, a collection of literature, poetry and writers from the Philippine diaspora. Thanksgiving is basically a Filipino gathering ... with a turkey. Three or four families gather in one space — uncles getting drunk, Titas and aunties talking — to eat never-ending food. It's very Filipino. Lately it's become kind of like a preamble to the holidays. We draw names for Secret Santa. Some of our Thanksgiving staples: my uncle's roast beef, which I'm looking forward to most. Sometimes my dad makes paella — it's a Spanish dish but we make it in the Filipino style. And there's lots of dessert. My aunt makes leche flan, and my cousin makes a cassava cake. 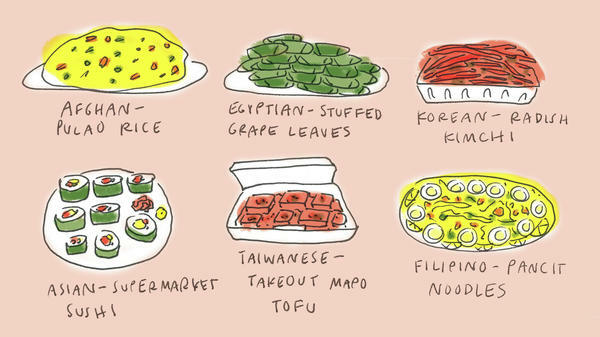 There's also lumpia [egg rolls] and pancit [a noodle dish]. This is our family's only excuse to partake in a larger American tradition, which is why we insist on having a turkey, even though it's definitely not the most popular dish. We all know no one's going to touch it. But year after year, we have it. What traditional dishes will be on your family's table? Which dish are you looking most forward to eating? Share your multicultural Thanksgiving with us on Twitter or Instagram with the hashtag #MyPOCThanksgiving and we may feature it on NPR next week.